God, do I love Adventure Time. My only regret is that I am not ten years old right now so that I can watch it with even more child-like glee. Remember the old ninja turtles cartoon where two of the turtles had swords that they somehow never found cause to use? Finn has swords and by God, he uses them. In one episode, he cuts a dragon in half lengthwise, from face to tail. It is such a striking example of old-school toughness that I am surprised it made it on the air, but that is Adventure Time for you. Also: The dragons in this world are the weirdest things I have ever seen, all bulgy and moist, with ventricle-filled sacs and visible butts. I don’t think I’d have it in me to stab one in the head, but then I am not exactly the heroic type. Then again, how heroic is it to slay a dragon? It is perhaps a bit ambiguous. Jake’s surprised expression indicates the fine line between a courageous act and cold-blooded murder. Regardless, we can all bask in the glow of a true man of action, as certain of his place in the world as a dog with a dead duck in his mouth. Congratulations, Finn. SCORE: A pile of bacon pancakes. 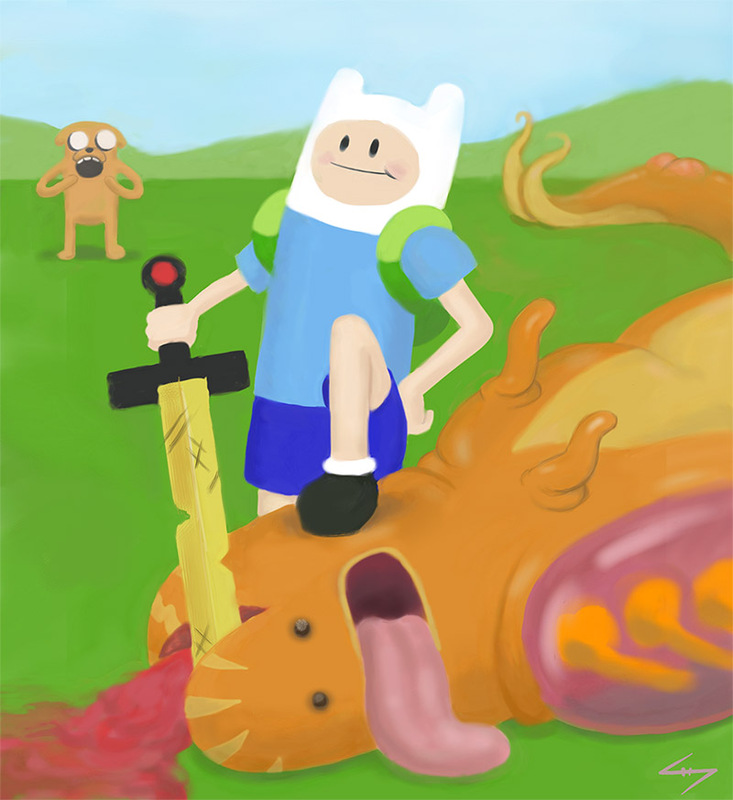 This entry was posted in Fan Art and tagged Adventure Time, Dragon, Fan Art, Finn, Finn and the Dragon. Bookmark the permalink.